Stepping into 2012 with... A Review and An Inspiration! It’s been just a few days since we stepped into 2012 and the year has already begin to shower it’s benevolence on me. As I opened my eyes into the New year, I found myself reveling in two moments of happiness and delight as a blogger and I thought of sharing them with all of you. 1. My Yatra Diary… Reviewed! We have all heard of books being reviewed, there are movies and television soaps being reviewed too but a blog, that too, by a blogger at his/her blog?! Yes, it's being done by The Fool @ his blog Lucifer House Inc. And when I came to know of this opportunity to get my little diary reviewed by one of the most promising and fair reviewers in the blogosphere, I grabbed it with both hands. This was special for me because besides being something completely new, it was also being done with a genuine intention and with utmost honesty. I extend my heartfelt gratitude to The Fool for taking the time out to review my diary and wish him all the success in this noble gesture of his. 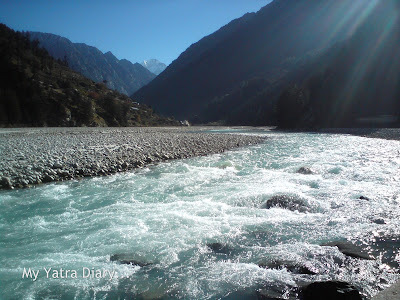 Yātrā, in Hinduism and other Indian religions, generally means pilgrimage to holy places such as confluences of sacred rivers, places associated with Hindu epics such as the Mahabharata and Ramayana, and other sacred pilgrimage sites. And My Yatra Diary is Arti’s record of her visits to places of pilgrimage in India. Please click on the link to read the full review – My Yatra Diary… Reviewed! What’s more, he is still taking it up and it is open to all. So, if you also wish to get your blog reviewed at the same time also giving it a chance to reach out to a wider audience, rush over to his space and queue your blog up in this blog review submission post. Taking this further, I request You - the reader of this diary - to help me improve by letting me know your thoughts and suggestions on this diary as well. You know what its flaws are and I trust you to know it best. So, if you have any suggestions/improvements for this blogger or blog, please feel free to leave a comment in the comment section below. Though I don't swear on acting on them right away or even incorporating them, but be rest assured that I will be surely considering them and if possible try inculcating them as well. 2. A Poet Takes Inspiration! How does it feel when one of your works gets picked up as an inspiration by a poet? And that too, by a poet you admire? ... on New Year’s Eve and began his blogging journey of 2012 with it. Thus, with an encouraging review and a beautiful feeling in my pocket, I step in the New Year with a silent prayer to the Almighty to continue making it good for me and for all of us here and bless us all with a fruitful year ahead. I will be on a short break for a couple of weeks from now. In the coming days, you can expect some guest posts, hopefully, from me and a few from others as well to fill up the pages. But, I promise, I will be back soon with another one of my yatras! Arti, congratulations on two achievements in less than a week into the new year. Enjoy your (brief) break and know that I wish you continued success and happiness in 2012. Enjoy your break Arti - we all need one sometimes! Cheers to a lovely new year ahead! Great beginning to the new year, Arti!!! and good going! May this year bring you much much more such accolades and opportunities.. and of course, filled with many more Yatras!! Hey, you really deserve this. I've always loved your blog. And the way you portray things, anyone can get hooked. As I suggested you before, I think you should go for a custom domain (ex: myyatradiary.com, artiyatra.com etc). As I've some experience with managing my own domain, I can help you with that. Let me know if you have any plans. Enjoy your new travels. All the best! Wonderful beginning of New Year Arti.All the best wishes to you. Wonderful post and your blog is definitely an inspirational one!! Have a wonderful break and I look forward to more of your wonderful posts, Arti! Already 2012 is holding out the hand of opportunity to you, Arti. Have a safe and healthy break. Seems like blogging is fun to you. Arti, what a wonderful start to yet another journey in the New Year!A remarkable blog and is full of visual beauty and nice write up! Waiting for your next series of Blogs! Kudos. Let your yatra's inspire us. What a wonderful shot of the river. I wish you many happy years of inspiration and blogging! You'r definitely a different kind of blogger..haven't seen many blogs on shrines, pilgrimages,holidays..glad I discovered this blog in 2011.I must say this blog has an aura of mysticism and natural serenity,divinity linked within.Hope you bring us readers more fascinating yatra diaries(With lovely pics)in 2012. Hi Arti, Happy New Year to u! Congratulations on a terrific start to 2012. Looking forward to your posts in the new year. Have a wonderful & enjoyable break. And return with a greater resolve to the blog-o-sphere with more path breaking,creative & adventure filled posts. I told you,you were a great adventure. Please enjoy your. I look forward to your new post,Arti. Have a nice time . Let the yatra continue . Congrats..Arti, you have done well. Your blog is informative , pics are superb, narration is awesome. How exciting to have your blog reviewed like this. A big fan of yours as you know, just keep up the good work and continue being you. Congratulations Arti! You deserve the blogging honor and the poet picked a wonderful photo for inspiration. Enjoy your blogging break; I look forward to your next journey. Congrats Arti!! I must say the review was genuine and honest!! What wonderful news! As you are going on a break, I am just returning from a couple weeks sick leave. I hope you have a good computer break and return soon! After reading this it was no surprise to me, you are bound for such success. All the best for your YATRA, keep penning more travel destinations. Good luck for travel in 2012. Great! A blog review. A very brilliant idea. Yours is always informative and entertaining, Arti. I feel like I'm going to a different world that is so wonderful every time I visit your site. @Arti Congratulations & waiting for your new post.All the best.Happy New Year 2012. Arti, all the recognition is well deserved. Your River picture is gorgeous and truly an inspiration for everyone. Happy New Year! Great stuff. He has put it rightly. I agree with him 100%. all the very best Arti .. hope to see you back soon ! Hi, Arti, you’ve started a wonderful year! I’m going to miss your post for a while, but blogging can wait. I’m sure you’ll find something more important and come back to us recharged. Nature never fails to inspire me, the same with the River Ganga and with your Diary. Congratulations. I hope you have a great year ahead and all your wishes come true. Have a great Yatra break Arti! I read the review and have also posted a comment there! The best thing about Yatra Diary is - When I'm reading it, Your way of writing makes me feel like I'm at the place you're talking about and experiencing things just the way you did! You've a very lively style of writing! And as much as I love Yatra Diary, I would love to see new posts making their way into it! Congratulations on your successful blogging! Your work is well deserved to review. I think the picture of River Ganda sure has something to evoke inspiration. How I wish I could take such a picture! eagerness you put into your blogging and consideration, attentiveness you show to people. May this year be more successful and fruitful for you! Congratulations your blogs would make a wonderful travel book. A good place also for making books from blogs is Blurb.com You can create your own book. You put so much into these wonderful blogs. Intrigued! Want to read more from your diary! I love the serenity of you blog and all your blog posts Arti ji!! Wonderful..Congrats Arti (a little belated though)..!